"A fun entertaining story...What makes this more than just a simple beginning chapter book about the fear and struggles of moving are the quirky characters and situations. Cyrus is adopted; Cyrus and Rudy's father is a logger which is not your typical job; and the fun opening chapter is all about potato guns, not your typical toy. Overall, early elementary students, especially boys, will enjoy this book and it would a good selection to recommend to students who may be moving." "Winsome black-and-white illustrations succeed in evoking the playfulness of young narrator Cyrus, whose struggle with the upheaval in his universe is handled with humor and real feeling. Cheerful and full of insight, the latest entry in the Orca Echoes series for reluctant readers is a real winner." "Expressive cartoon characters in black-and-white sketches accentuate the hope and love found in a caring family. Exaggerated facial expressions, including those of the family cat named Wigglechin, offer a humorous perspective. The cat's high-spirited antics, such as hangingupside down from outside the kitchen window or perching precariously from the For Sale sign in the front yard, also help to keep the tone light...Short chapters and punchy characters make this selection a natural choice for readers moving to longer chapter books." "[Offers] an age appropriate plot and funny characters. 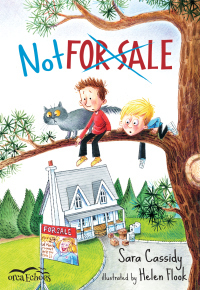 At just over fifty pages, with illustrations interspersed throughout, the length is manageable for readers transitioning from picture books to chapter books...Each character has their own quirks that are embraced and celebrated by their family members, and Cyrus shows a great deal of empathy towards his brother." "From the intriguing opening sentence ("Ancient potatoes lurk in our bedroom closets") to the feel-good conclusion, this very brief effort appealingly captures a small slice of very funny family life. In between are tolerant, loving parents, an admirable relationship between brothers, a bizarre but humorous cat, numerous rib-tickling, full-page illustrations, and some quirky problem-solving. Perhaps the only downside is that young readers are going to be trying to figure out how to build potato-guns—they look like water pistols but shoot spud chunks—of their own. 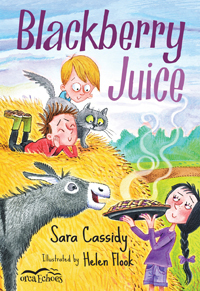 A warmhearted romp that might even work for older reluctant readers." "The characters are each quite delightful...[and] the book has a gentle humour although the themes are serious. Cyrus’ anxiety about moving is described and will be recognised as real by any child who has been relocated. 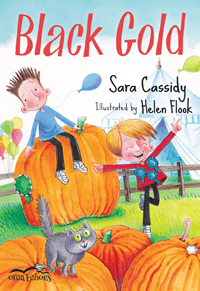 The cartoon style drawings by Helen Flook add to the whimsy of the book...Cassidy is an experienced writer with a variety of published works, mainly for teens. I hope she writes more for this age group."